Spied this Witchhazel during a Sunday afternoon stroll at Duke Gardens. 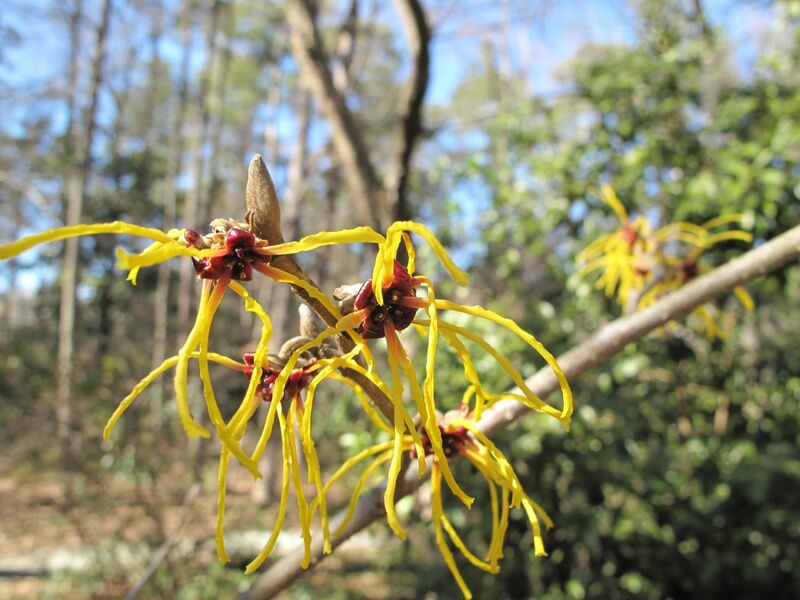 This entry was posted in garden and tagged Sarah P. Duke Gardens, Witchhazel, wordless wednesday on March 11, 2015 by pbmgarden. I had no idea how beautiful Hamamelis is until seeing them on blogs this winter. Lovely! Same here Cathy. I didn’t notice a fragrance with this one though. A beautiful sign….I hope mine finally blooms this year. Hope you Hamamelis does well for you this year Donna. Beautiful, such long thin petals, this is a variety I’ve not come across before. Hi Pauline. I thought it was especially attractive too. The signage for this Hamamelis at Duke Gardens indicated “Garden Origin,” so it may not be commercially available. Thanks, it’s so nice to start seeing some blossoms here. It’s lovely to see some beautiful shrubs in bloom in your neck of the woods. I bet you are glad to see the first signs of spring! Thanks Matt. It feels so wonderful to see signs of spring. Makes me happy. It always excites me to see the first flowers of the year…Great response to the challenge. I admired many witch hazels on others’ blogs the last few weeks, so was excited to find this one at Duke gardens. Beautiful! I admired this one on a recent visit to the winter garden at Anglesey Abbey. It made me wonder whether I perhaps have room for just one more Witch Hazel. Oh, I hope you can find a spot to tuck one more Witch Hazel.